If a girl screams in the forest and no one hears her, does it make a sound? But let’s not spoil the ending, we’ll start at the beginning. I’ve done short bursts of solo travel, but never such an ambitious trip. I guess you could call it a cathartic journey. Post quick fire break ups it wasn’t just that I wanted to escape into the oblivion of travel bliss, it was that the very core of me was screaming for the need to be alone – in fresh scenery, with head space. People rave about the merits of solo travel. The autonomy, the freedom, the sense of accomplishment -navigating across new cities and countries alone! But no one speaks of the challenges. Solitude is a two edged sword, and sometimes with it comes a bitter loneliness. And yet when you come face to face with it, it’s not as bad as anticipated. Perhaps it was for this very reason I was drawn to countries off the beaten track, minus the hordes of backpacking revellers – forever looking for their next drink and their next root. Lost in the world, but purposefully so. I thought my lowest point was stuck in a Latvian hospital for 5 hours, awaiting a brain CT scan after a bicycle incident where I didn’t remember hitting my head. That was until I spent a night in a cabin in the woods clutching my nail scissors. They were sharp, but not as sharp as I would’ve liked. I’d found a travel oasis. 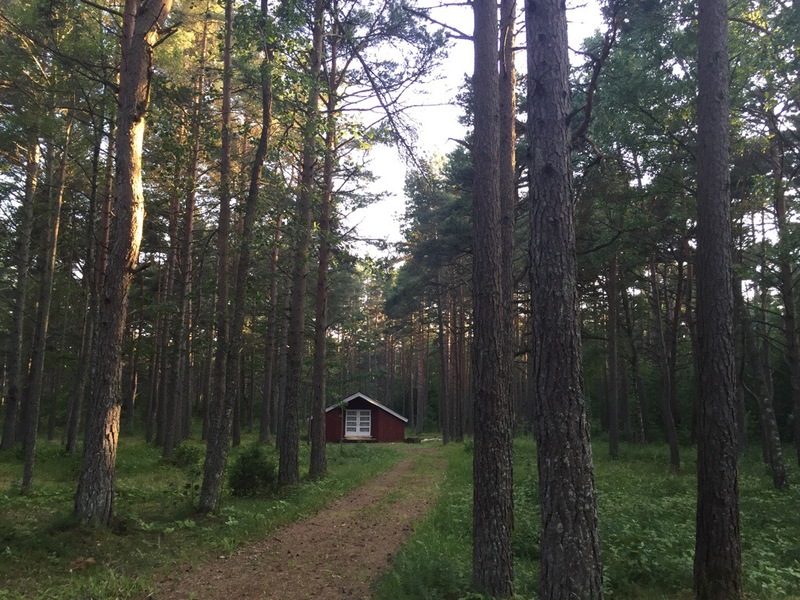 Solo cabins, surrounded by beautiful forest beside a beach on one of Estonia’s western islands. Only €15 per night. There were no other travellers there, just a handful of local families on holiday. Initially I revelled in such a find off the beaten track, but then as night drew in a sixth sense told me this was too isolated. I was too obviously foreign and too obviously alone. All the empty cabins seemed to be watching me as wandered past. I decided the next day I’d leave for Tallin the capital. Tired still from the remnants of the concussion I went to sleep early. Something snapped me out of my deep slumber. The door handle jerking? My patio light was on and a tall man was standing there looking in. How long he stood there I do not know. Watching me sleep? I didn’t know his intention but I knew it wasn’t good. I’m not sure if I moved, or if he saw my eyes snap open but he swiftly disappeared into the night. After what felt like an eternity, I slowly reached over and checked my phone. 210am. I checked my surroundings, trying to devise a plan if he came back. The only exit was the glass door where he’d been standing. The window to my left had no openings. I debated whether I could throw my phone through it and climb out. My toiletry bag? That was heavy. It was going to be a long sleepless night. Maybe I should call the police? I cursed myself that I didn’t know the number and hadn’t gotten around to topping up my phone. Idiot! 911 – that was universal surely? Next thing I was being transferred to an English speaking operator. And before I knew it two policemen were outside my cabin. “There’s no one here.” Obviously. But there had been. “The light. The censor light came on” I stammered. Why wasn’t it on now then I wondered? The policeman raised eye brows at each other, obviously thinking the same thing. As the 4am sun rose, I fell into a fitful sleep clutching my phone and nail scissors wondering if I’d imagined the whole ordeal. When I awoke I noticed the patio had a light you switched on from outside. So the creep had been watching me sleep, and that explained how he dissolved into darkness so quickly. Counting my blessings I googled the next bus out of there. The moral of the story? It’s one thing to be utterly absorbed in a new world, it’s another to go so far astray you might not be found. For all my soul searching and radical adventures across the Phillipines, China and the Baltics, I was pleasantly surprised to find that the 2nd half of my trip had somehow been interspersed with good friends from home. Whatever it was I’d been trying to prove to myself, I guess I had proven it. I can’t imagine many things more frightening! I hope your head is on the mend 🙂 Be careful out there!